If you bypass a butcher to just grab a couple of steaks or a chicken from the store, you might not be making the most of your meat-buying dollars. Having a butcher you can depend on is the next best thing to buying a part of an animal from a local farm or meat CSA (and requires a lot less freezer space). If you have a dish at a restaurant with an interesting cut of meat, they can replicate it. Recently, I was reviewing a restaurant for Organic Hudson Valley Magazine and had a pork shank, something I wasn’t familiar with. I mentioned it to Barb and she was intrigued enough to start cutting some shanks from the pig she was breaking down. You know where your meat is coming from. They have relationships with farmers, so you’ll know how it was raised, finished and butchered. They can guide you to lesser known cuts (often known as butcher’s cuts) that are often less expensive and more flavorful. While cuts like short ribs and skirt steaks have gained popularity, flat-iron steaks are still flying under the radar and well worth checking out. They can give you recipes and ideas. This is really useful if you want to try out some of the lesser-know parts of an animal. Often, if you have a recipe in mind, they can give you alternative meat ideas that might save you some money. They can teach you a lot of stuff. I learned how to test for doneness by just poking the meat. Here’s a link to the video I made; it’s much easier to see it in action. They can custom cut anything for you (although I always feel guilty about asking to have a chicken cut up—it’s so easy and I should practice my knife skills). They can grind it for you (important if you’re making something like steak tartare or have a special hamburger or meatloaf mix in mind). They can tell you about new stuff they’re working on and save you some. 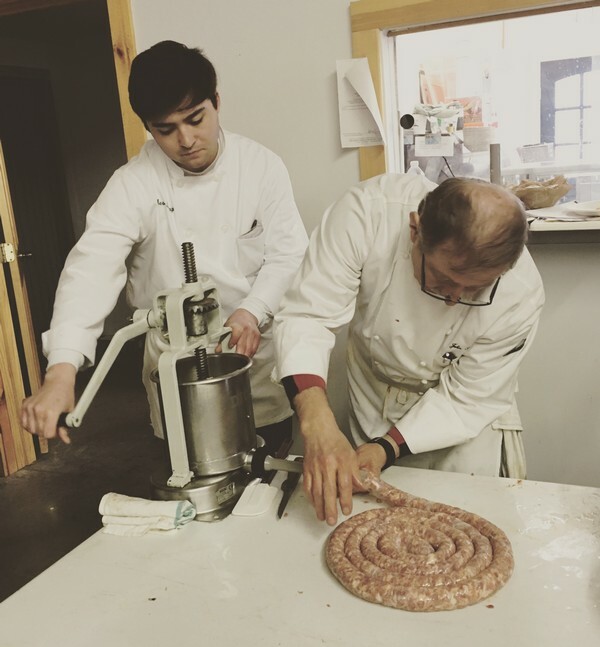 Barb recently made some Saucisse de Toulouse that were terrific! They may be making great sandwiches. Sometimes they’re posted and sometimes you just have to be in the know, but look for great brisket, Cubans, or Italian combos to be on the menu. You’re supporting a local business (and probably more than one, if they’re buying local meat). Did I miss anything? What do you like about shopping at a butcher? Not something you’d generally think–hmm, sounds interesting. But never followed up with. They say things happen for a reason. Which is how, on a rare sunny day, I ended up in Beacon. Ostensibly to try out a new burger joint – Meyer’s Olde Dutch – and also to check out Barb’s Butchery shop. As it turns out, my partner in HudsonValleyEATS.com sold Barb the store she has. 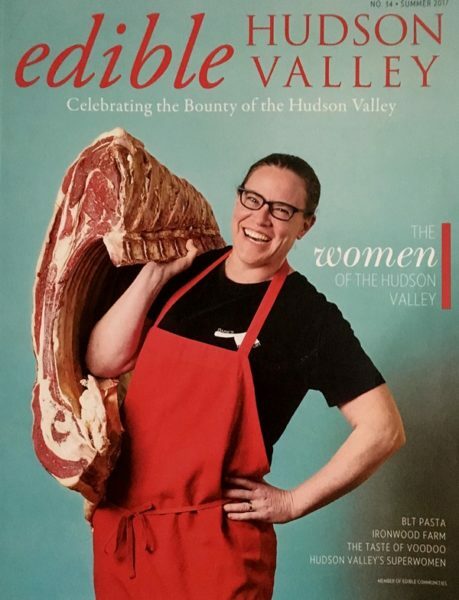 And a recent guest on the radio show, Jennifer Solow, the editor of edible hudson valley, had just featured Barb on the cover, striking a jaunty pose, a haunch of beef slung over her shoulder. So now I had two good excuses/connections to meet Barb. After burgers, we went down and met Barb and her team. The shop is on a quiet corner in Beacon, lined with butcher cases filled with pristine looking meat. 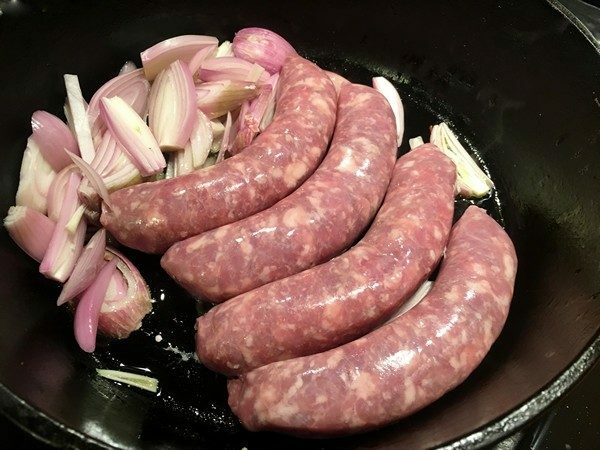 Great looking sausages, perfectly cut steaks and short ribs, everything looks like something you’d be happy to cook and eat. We watched them making a batch of what they call NAM North African Mint. It smelled wonderful and is their version of merguez—a little spicy, with pork replacing the traditional lamb. She set some aside for me to pick up a couple of days later and they quickly became a favorite. You might want to keep an eye out for their monthly specials, especially if you have freezer space and/or are expecting a crowd. 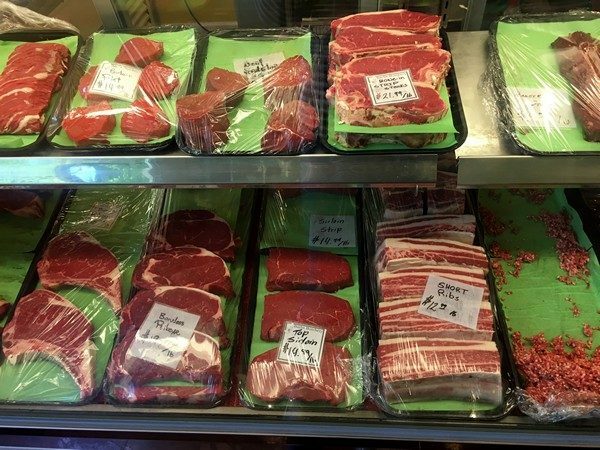 We got a great assortment of steaks, pork chops, a chicken etc. in ours and all the meat was delicious (and local). My husband went down to pick it up (order in advance please) and discovered the lunch counter side of Barb’s. 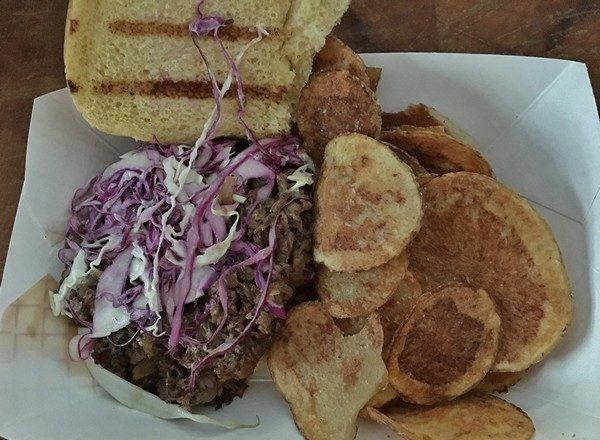 He got what he considers to be one of the best brisket sandwiches ever—her own smoked brisket topped with slaw and her onion BBQ sauce—all made in-house and topped off with homemade potato chips, hot from the fryer! It was so good that after our second brunch at the Roundhouse, we went over so everyone could get one to take home for dinner (and they were yummy)! While we like to support local businesses and especially women-owned ones, it’s great to want to go to Barb’s. Hang out, watch them making up batches of sausages, have a great sandwich and take some great local meats home with you. This is a re-run of my post after the event last year in case anyone wants to attend week 2. We talk about nose-to-tail eating, but how does it really work? Come and see what happens when two chefs take on all the parts of a whole pig. 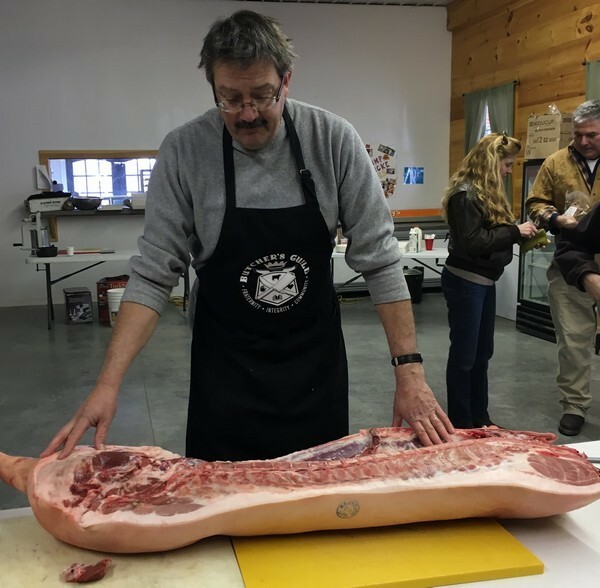 We’ll be focusing on using all the parts of the pig–smoking ribs and bacon, making a variety of sausages and stuffing the head to make headcheese (one of my favorites from last year!). There’s still time support Slow Food Hudson Valley and get tickets for the second part on Saturday, March 25 from 10-4. 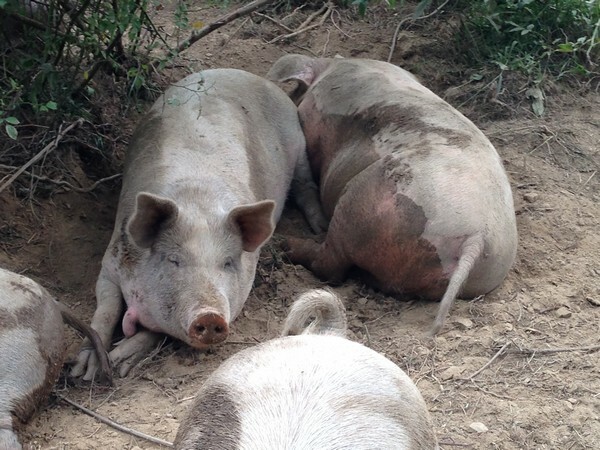 Saturday, the Accidental Locavore and about a dozen people watched three chefs tackle a pig. It was part of a two-day program Slow Food Hudson Valley put on to promote snout-to-tail eating (which reminds me–what happened to the pig’s tail?) or “butchering, preserving and sausage making a heritage pig. We were in a freezing cold farmstand on Kesike Farms in Red Hook NY, watching Chef Tom work his way through half of a hundred-pound pig. He did it with very few tools, and the ones that he’d chosen were all easily acquired, if not already in your arsenal. For the whole pig all he used were two boning knives, two hand saws and a sharpening steel. One of the hand saws, a Japanese, flexible bladed one, was a recent purchase from Lowes. In case you’re interested in breaking down any sort of animal (bigger than a chicken), remember knife first, then saw. 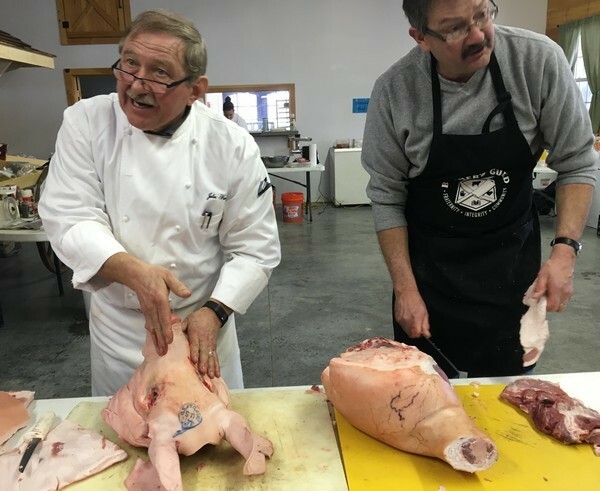 As he went through the pig he used a technique he referred to as “seam butchering” or finding the seams between the bones or muscles and using them as reference points. Between American and various European methods, there are a lot of ways to butcher a pig—choices you get to make as you cruise along. 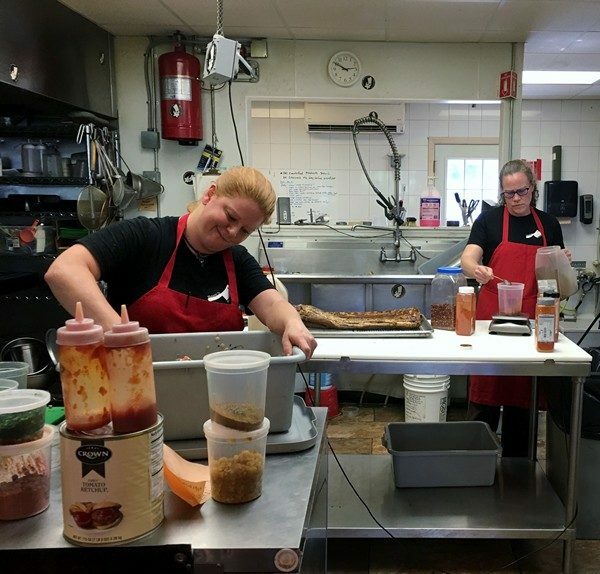 Once Chef Tom got through cutting the pig into his basic cuts, he went back section by section, boning almost everything except the baby back ribs. He showed up his way of tying up various hams and roasts. While he was working, there was a lively discussion of the best ways to use each of the parts. Neck bones (which I forgot to ask for) are supposed to make your regular tomato sauce just amazing! Cumin, for some reason, played a major role in almost everything—it was simply the joke of the day. 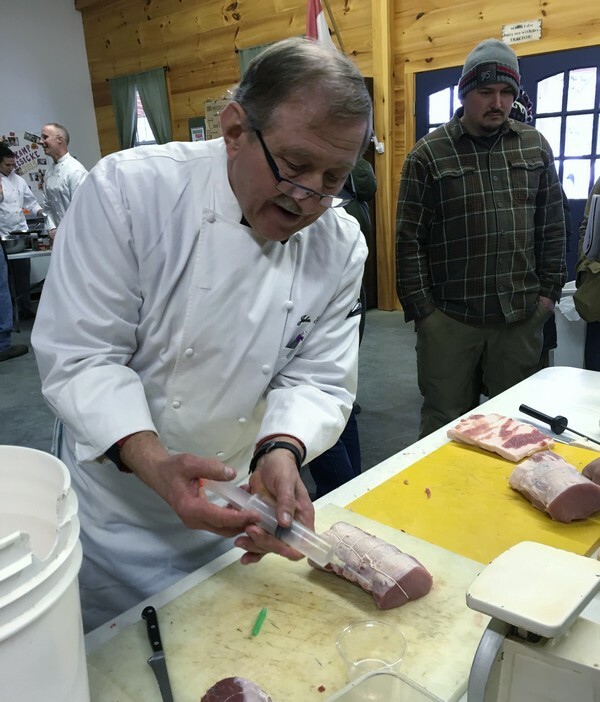 Then Chef John stepped up to demo how to prep the various pork products for bacon, sausages and headcheese (yes, you use the whole head). He made a brine, using some for a loin and injected another piece with brine, explaining when you would inject versus when you would submerge. The liquid injected, should be 10% of the weight of the meat you’re using. The head and feet also went into the brine. We’ll see what happens to them next week. After the brining, John showed us how to do a bacon cure. 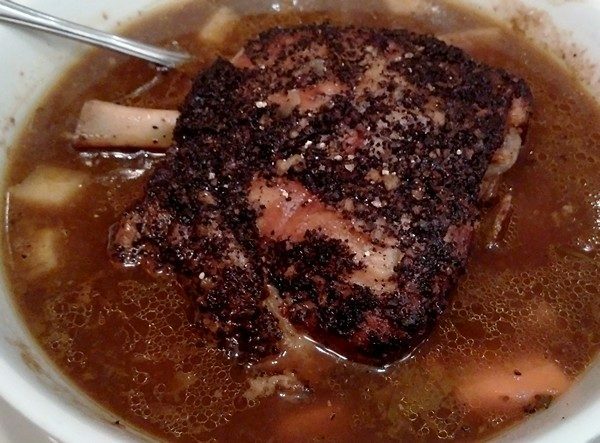 It’s essentially a dry rub with salt, sugar, and whatever spices you want to add to the mix. You coat the bacon with the cure, cover it (or put it in a Ziploc) and refrigerate. Every other day, you need to flip the meat so it gets cured evenly. Another thing to look forward to next Saturday! From there we went on to making sausages. 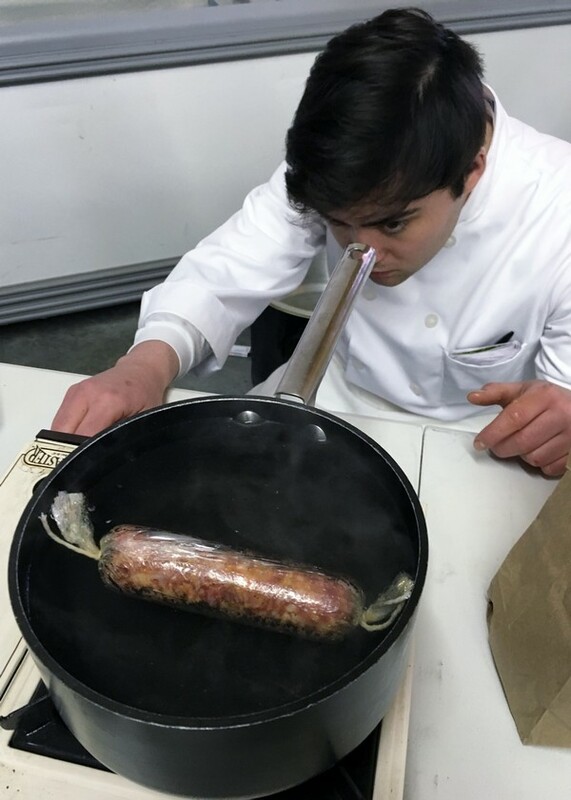 When you make sausages, it’s really important to cook and taste the meat before you stuff it. I always thought you just made a mini patty and fried it. No, no, no. Chef John said it’s not a good way to see how the finished product will actually taste and the texture is completely different. His way? Make a sausage-sized log, wrap it tightly in Saran Wrap, and poach it until it’s done. Then taste and adjust the seasonings. We ended the day, tasting his sweet Italian sausages and a southwestern green chile sausage. Both were really great and even better? We got to take some home. I can’t wait for next Saturday! Lots of smoking going on next week. And we’ll get to try our bacon, make some tasso, have some ribs, even some headcheese. Sound tempting? 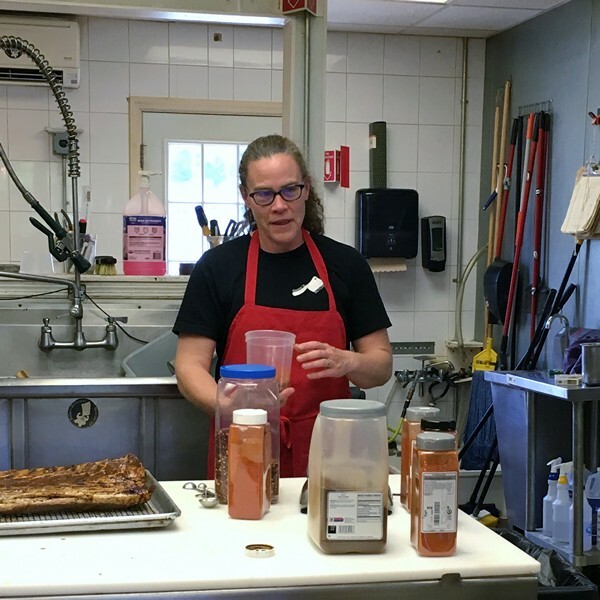 There are spots available so come join us–Slow Food Hudson Valley has all the info.